You are here: HomenextTopicsnextTransportnext"All Aboard"
Before the rebuilding of the railway station in Wickford in 1980 there was, and still is, a foundation stone on the outside of the building. 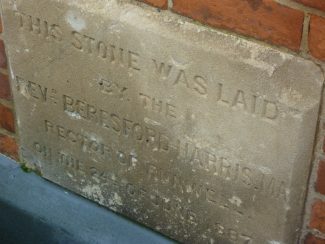 It was dated June 24th 1887 and was laid by the Rev. Beresford Harris, Rector of Runwell, who, along with Mr W. J. Beard, M.P. for Mid-Essex, had been a keen supporter of the need for a railway. In the 1860s there had been plans for a railway line from Shenfield to Southminster. There would be a line from Rettendon, through Wickford, to Pitsea, joining the London, Tilbury and Southend Railway (LT & S), which had opened in 1854. This “South Essex Railway” was never built because sufficient capital could not be raised. Some thought that the LT & S Railway misused its monopoly. The Rev. Beresford Harris said that he needed to catch the 8.20 from Pitsea in order to arrive in London by mid-day. The next train did not leave until 11.52. The last train from London left at 7.45 in the evening. A connection at Shenfield from the Great Eastern Railway (GER) line to Colchester and Clacton would cut costs for Wickford people. Local farmers would no longer have to take their produce to Tilbury or Chelmsford in order to transport it to London. Coal for heating was being brought in from Battlesbridge wharf at a cost of 23 shillings a ton plus one shilling a mile for transport – another expense that could be reduced. An Act of Parliament of 16th July 1883 empowered the GER to build a line from Shenfield to Southend, via Wickford, and a branch line to Southminster, with additional connections via a triangular junction from Southend to Woodham Fen and Maldon. The line from Shenfield to Wickford was contracted for £104,996 8s 11d. Construction entailed building a large embankment and the removal of several buildings. The station building was built “with a view to future traffic as well as the present”. Thomas Locking was the Station Master. The line opened for goods traffic on November 19th, 1888. The opening for passenger traffic was marked by a celebration at the Castle Inn on January 1st, 1889. The first departure carried two ladies and a policeman to Shenfield. Later in the day a special train brought directors of the GER from Liverpool Street to Wickford, then back to Billericay for lunch. Wickford station had two platforms and both general and first class waiting rooms. There were about eight trains a day. A daily fast train could do the journey in under and hour but most took longer. Passenger compartments were “steam heated” by cans of hot water. In 1895 a quarterly season ticket from Wickford to London would have cost £3 15s 3d. or 10d a day. By 1911 there were six fast trains a day. The branch line to Southminster was opened for goods traffic in June 1889 and for passengers on 1st October 1889. The main line to Southend also opened in October of that year. There was a double track from Shenfield to Wickford but only single onwards to Southend and Southminster. A spur, running through Shotgate (the Fanton Curve), made it possible to travel from Southend to Colchester, avoiding what was now called Wickford Junction. However the route was little used and was discontinued after four years. Travellers could still make the journey by changing at Wickford. The connecting line between Woodham Ferrers and Maldon was closed in June 1953. The Wickford Station’s turntable , which enabled trains to be turned around, was closed in 1954. Here is the signal box. The building of the railway entailed the construction of two viaducts, 67 bridges and the excavation of almost 3 million tons of earth. Cottages for employees were built by the bridge in the High Street and at the level crossing where the line crossed Wick Lane. In 1907 a further 12,800 cubic yards of earth were removed from the area which is now the Co-op car park behind the High Street. A reservoir was constructed to hold 2 million gallons of water, taken from the River Crouch, for use by the steam engines. A sheep sale yard was located near the High Street railway bridge, opposite The Castle, and the cattle yard was on the other side of the line. On a Bank Holiday weekend between 1900 and 1910, between 27,000 and 31,000 might make the journey from London for a day out at the seaside in Southend. Some may well have alighted at Wickford, preferring a day in the country. The railways did all they could to encourage people to settle in Wickford and played their part in promoting land sales in the village. From 1911, to encourage more passengers, they introduced a restaurant car to the 8.15 morning service. A midnight supper train arrived in Southend at 1.10 a.m.
During the Second World War enemy aircraft would follow the railway line on their missions in and out of London. The area around the railway and Wickford Station itself suffered from several bombs. The line was electrified in 1956. Goods traffic was no longer handled after 1967. In 1988 the original bridge across the High Street was replaced with a new one . See also pictures here . The old bridge can be seen here. The Railway Station was damaged by fire in November 1998. It is undoubtedly true that Wickford would not have developed into the growing town it is today without the railway. In 1923 the line became part of the London and North Eastern Railway and then part of the Eastern Region of British Railways in 1948 and Network South East after June 1986. With privatisation in 1997 the railway became part of First National Great Eastern and after various changes the franchise is now known as Greater Anglia.